When laziness and lack of creativity clash, I end up trying really hard to think of what to do at home today. 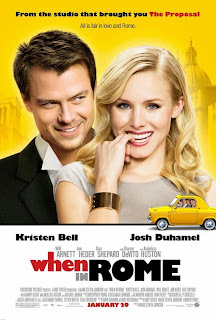 I'm not rich enough to fly myself to Rome but I actually downloaded the movie "When In Rome" and decided to check it out ~ to kill my boredom. Just as Beth convinces herself to believe in love again, she sees Nick kissing another woman. Slightly drunk, she picks up coins (a poker chip, a rare coin, a penny, a quarter and a nickel) from the “fountain of love”. She later learns from Joan that according to legend, if you take coins from the fountain, the owner of the coin will fall in love with whoever took the coin. She has to return the coins back to the fountain to break the spell. Scene of Beth and Nick in movie "When In Rome"
Think I'll check it out... Lets see how funny it is. how is the movie?? worth watching? cos someone told me that it was crappy..